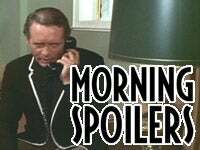 Today's spoilers include a picture of a major Star Trek moment, and new Wolverine posters. And we've got sneak peeks from Knowing, BSG, Sarah Connor, and Brave And The Bold. Spoilers: your window into futureland.